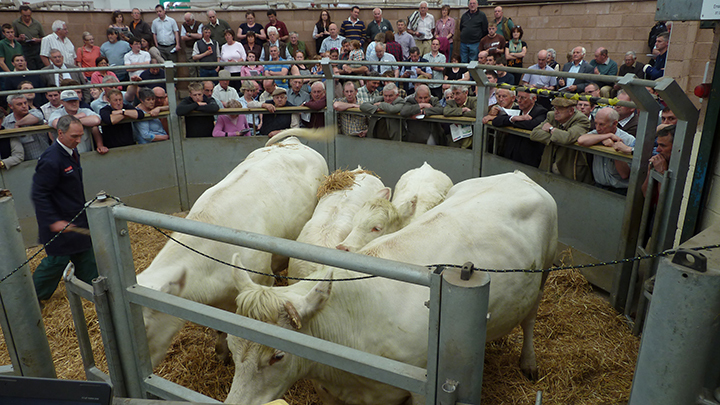 Charolais sold to a top of 3,600gns twice in Exeter on Saturday 17 May when George and Vernon Staddon, Plymouth dispersed their Louis herd. The first 3,600gns bid was made for Louis Daffodil, a six year old Louis Axminster daughter offered with her seven month old bull by Thrunton Fitzroy. The buyer was Brian Lavis, Okehampton. The second 3,600gns call came later in the day from Fred Hayes, South Molton for Louis Henstridge, a two year old bull by Cockerington Brutus. First lot in the ring, Louis Celandine, a seven year old by Shraden Tophat sold with her nine month old bull calf by Thrunton Fitzroy was secured for 3,400gns by Colin Edwards, Tavistock. Next at 2,600gns was another Tophat daughter, the 10 year old Louis Velvet accompanied by her eight month old heifer to Patrick Greed, Exeter. The spring calved cows were headed at 2,050gns for Louis Daisy, a Louis Axminster daughter with her three month old heifer to Paul Harris, Kingswear. Leading served heifer at 1,550gns was Louis Gillia, a Cockerington Brutus daughter to Messrs Chandler, Shropshire. The herd’s stock bull, Thrunton Fitzroy a three and a half year old by Maerdy Cecil made 2,700gns to Messrs Gribble, Launceston, whilst Tolgus Dependabull, a six year old year old Moynton Alexis son attracted a 2,000gns call from Ross Skelley, Plymouth.